Ubuntu-based things do well in tech circles, but the consumer space is different, as gOS discovered when Wal-Mart blamed poor demand from baseball caps and mullets for its decision to stop selling Linux-loaded PCs. David Liu, chief executive of Emeryville, California-based gOS, is undaunted. Indeed he is optimistic that Linux can succeed in the consumer market, on "next generation" appliances and the increasingly popular netbooks that offer the "best experiences". 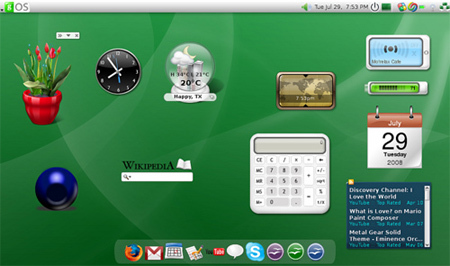 To that end, gOS has launched version 3.0 of its consumer-focused Linux operating system, which packs in Google Gadgets. But Liu also sees a threat on the horizon. Why? OEMs are only flirting with Linux in the consumer space, and that leaves the path clear for Microsoft on netbooks and appliances to duplicate its PC-based Windows empire. "Linux companies like ourselves need to work closely with people making the next wave of appliance or netbooks... we need to seize it before other people fill the gap," Liu told a LinuxWorld panel on life, now that OEMs are shipping Linux PCs. "The business model of Microsoft will adjust down [to netbooks and appliances]," he told The Register afterwards. "We can do it, but it's a really small window of time. The PC world is moving on." Liu agreed that it is hard trying to catch consumers' interest in a channel geared towards Windows. "We have been trying to resize and use open source to appeal to consumers, but to be honest it's tough," he said. OEMs have been shipping more Linux on selected PC models, but have yet to make Linux generally available as a pre-installed and supported option. They still rely on Windows and look certain to continue doing so as companies like Hewlett-Packard, Dell and Lenovo respond to the run-away Asus' EEE with their own netbook-style devices. Demand for Linux does exist with Linux-powered PCs going into specialized markets like education. HP's recently launched mini notebook - also for education and available with SuSE Linux, Windows XP or Windows Vista - has been enjoying adoption outside of its intended market. HP technology strategist Jim Mann told LinuxWorld there hadd been: "A lot of interest and purchase from business executives". Mann was one of the few OEMs on the panel to venture an opinion on the subjects of Linux versus Windows and the netbook craze. The reason that OEMs are not offering Linux more broadly is simple - and timeless: usability and the lack thereof. "From a general operating system perspective - there's still a lot of packages to download. That's not something you are going to see my mom use," Mann said bluntly. "Until it gets to the point where it's drop-dead simple or devices lock down functionality, you aren't going to see much uptake among consumers." Liu reckons that Linux has improved. The problem is that OEMs aren't working to fit Linux-based netbooks or appliances into their portfolio in a way that consumers can understand and at the same time doesn't compromise existing revenue streams.